Us mere Muggles always miss out on the best things in life. Flying, having a wand. Not anymore! Jason Atherton’s Soho tavern Blind Pig has launched a menu of cocktails inspired by children’s books. And now there’s an even better reason to visit, with all your favourite children’s stories converted into more ‘adult’ drinks, including a butterbeer drink available on tap. The drink, titled Half a Pint ‘o Buttah is based on the Butterbeer made famous in Harry Potter books, and contains whisky, Kamm & Sons, thyme, beer and, of course, butterscotch. On the menu is also ‘Long and Short Great British Tails’ which includes a Winnie-the-Pooh-themed Hunny Pot with buttered rum, mead, apple brandy, lemon and honey, plus a gin-based Mr Tumnus Tipple from ‘The Lion, The Witch and The Wardrobe’. There’s also a Lost and Found, a drink dedicated to Paddington Bear and includes Peruvian pisco and marmalade. Yum! If you’re more of a Roald Dahl fan you won’t be disappointed either. With luminous drinking from the Dream Jars just like in ‘The BFG’. 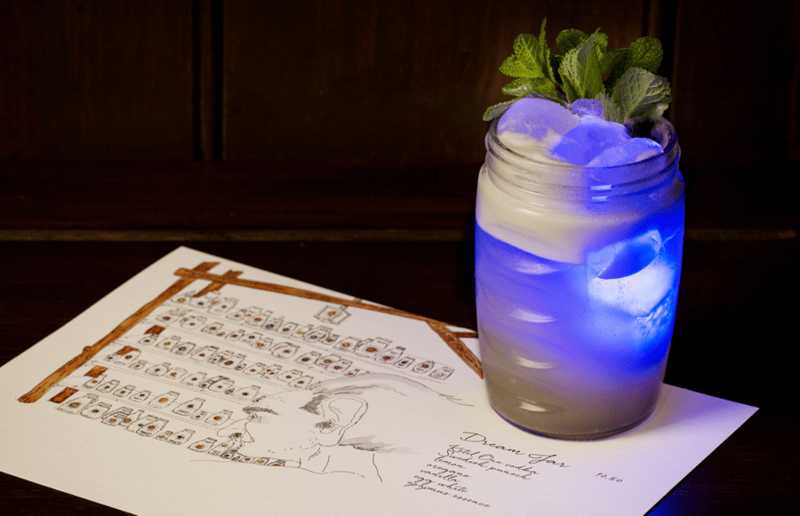 The drinks are served in jars filled with glowing ice cubes, as well as other dreamy ingredients.